Whether you’re a leader, human resources professional, aspiring professional coach, or in a position requiring leadership qualities, as a participant of this program, you will learn transformative techniques that empower you to create sustainable change in yourself, your organization & your clients-- and become a certified professional and transformative coach and get credentialed. 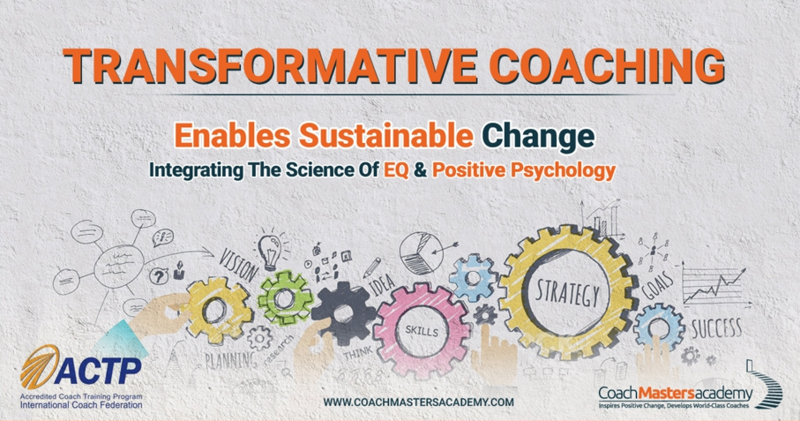 Using a revolutionary approach to delivering sustainable change Coach Masters Academy has developed a proprietary coaching technology: Awareness-Clarity-Choice (ACC) Conversation that integrates the science of Positive Psychology and Emotional Intelligence. This unique framework applies advanced adult learning theories that are empirically supported and that have shown to produce positive results in key domains like personal and work relationships. - Acquire the coaching skills to engage in a learning conversation that enables people to experience a powerful shift in their thinking. - Accelerate your coaching competencies at an advanced level because the training standard delivered and benchmarked is at a Professional Certified Coach (PCC) Credential level designated only for proven coach. • May earn you the title of Associate Certified Coach (ACC) *after fulfilling all ICF requirements. HKICC serves professional coaches, those who use coaching as part of their job, or anyone who is interested in becoming a coach or learning about coaching. HKICC has around 170 members and there are over 800 subscribers on our mailing list. Give us your email, we'll give you a whole lot of awesome coaching news. Not spam.